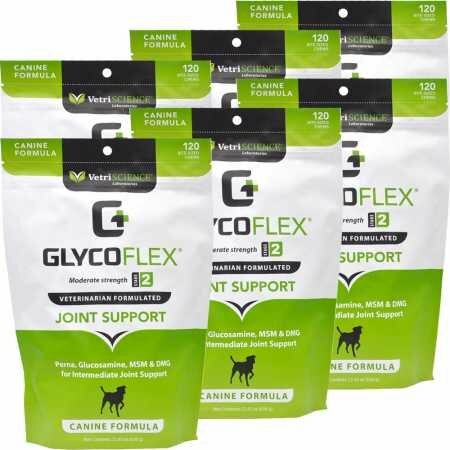 GlycoFlex 2 Hip and Joint Supplement for Dogs represents the second stage in our comprehensive line of joint care products. Recommended by veterinarians, GlycoFlex 2 is the right choice for dogs that are slowing down or showing signs of fatigue or weakness in their hind quarters. 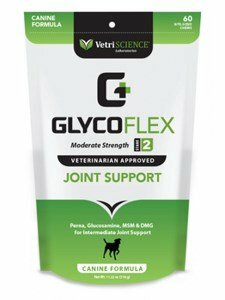 GlycoFlex 2 includes perna canaliculus and glucosamine for joint structure support as well as MSM for discomfort. 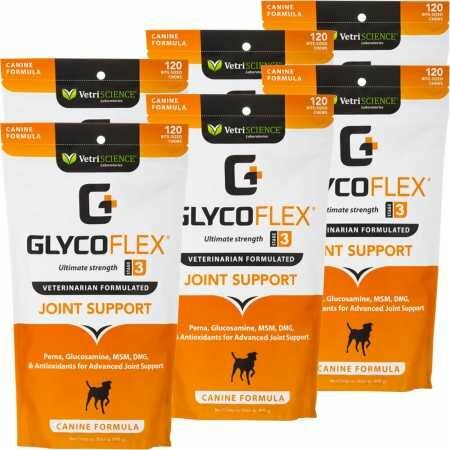 For active dogs or lap dogs GlycoFlex 2 helps alleviate joint discomfort associated with day to day activities. Athletic dogs need additional nutrients to keep them running, hunting and jumping all day long. GlycoFlex Sport has been formulated to meet those needs. This formula includes Perna canaliculus, a green lipped mussel that naturally provides all of the nutrients that keep joints lubricated and cushioned. We also include glucosamine, MSM, Manganese and DMG. Manganese is an essential mineral that supports the formation of collagen and GAGS. These are necessary for supporting already present cartilage around the joint and may help to rebuild cartilage that is damaged during daily activity. DMG helps to manage inflammation in and around the joint while also providing the added benefits of better oxygen utilization and supporting focus and stamina. 6 PACK GlycoFlex 3. These delicious, chickenflavored, soft chews are recommended to provide maximum support for joint function and connective tissue health in dogs with severe joint dysfunction. 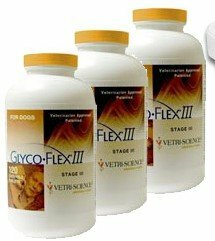 GlycoFlexreg; 3 represents Stage 3 of our comprehensive stage of life program for joint support. It's also recommended by veterinarians for geriatric and working dogs as well as a followup to orthopedic surgery. Effective alternative available for only 24.99 (120 Soft Chews) Comparison between old and new formulas. GlycoFlex 2 Hip and Joint Supplement for Cats represents stage 2 of our comprehensive joint support program designed to meet the needs of cats starting to slow down due to age, weight issues or the onset of joint health issues. 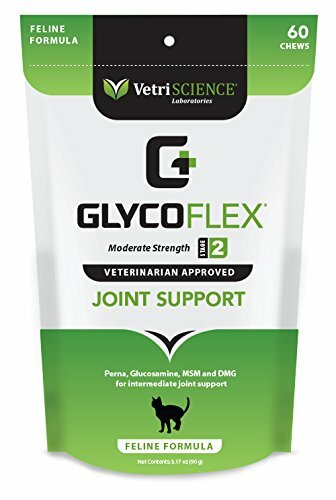 Recommended by veterinarians for over 30 years, GlycoFlex 2 for cats includes quality joint support ingredients like glucosamine and MSM as well as our signature ingredient perna canaliculus sourced from the waters of New Zealand. Combined these ingredients lubricate and support joint structure and activity to help keep cats healthy and happy. Glyco-Flex II Soft Chews 120 ct. These delicious, chicken flavored, soft chews are recommended to provide comprehensive support for joint function and connective tissue health in dogs with moderate joint dysfunction. 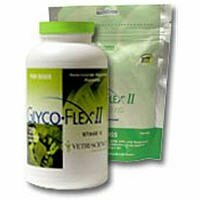 GlycoFlex 2 represents Stage 2 of our comprehensive stage of life program for joint support. It's also recommended by veterinarians for adult and maturing dogs, sporting and working breeds as well as a followup to orthopedic surgery. More Effective alternative available for only 83.99 (480 chews) Comparison between old and new formulas. 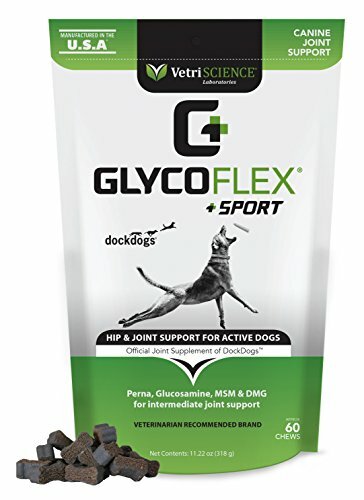 Vetri-Science Glyco-Flex Stage II Joint Support Formula Bite Sized Soft Chews for Dogs provides comprehensive support for joint function and connective tissue health in dogs with moderate joint dysfunction. 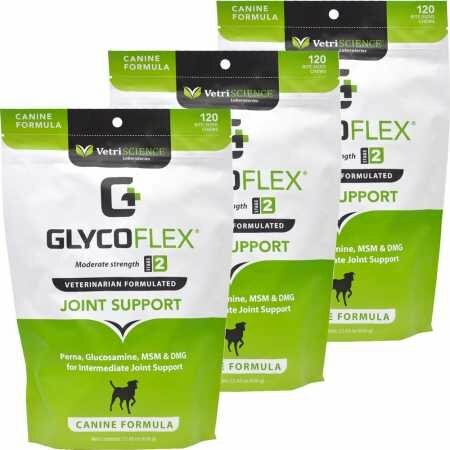 Vetri-Science Glyco-Flex Stage II Joint Support Formula Bite Sized Soft Chews for Dogs represents stage II of our comprehensive stage of life program for joint support. It's also recommended by veterinarians for adult and maturing dogs, sporting and working breeds as well as follow-up to orthopedic surgery. Glyco-Flex II Soft Chews New Formula These delicious, chicken-flavored, soft chews are recommended to provide maximum support for joint function and connective tissue health in dogs with joint dysfunction. Glyco-Flex® II represents Stage II of our comprehensive stage of life program for joint support. It is also recommended by veterinarians for geriatric and working dogs as well as follow-up to orthopedic surgery. 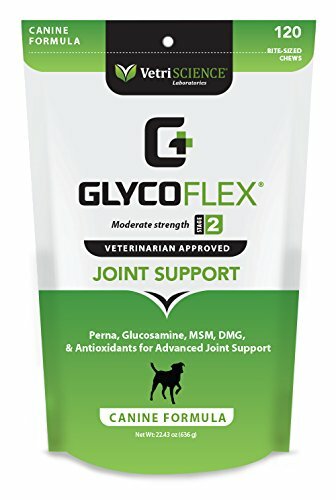 Joint Supplements, Glyco-Flex Bite-Sized Soft Chews are a delicious chicken liver flavored nutritional supplement for maintaining healthy joints. Glyco-Flex II Bite-Sized Chews are for Cats and Glyco-Flex III Bite-Sized Chews are for Dogs only. Both are formulated with Perna, Glucosamine, MSM, DMG, and Manganese. 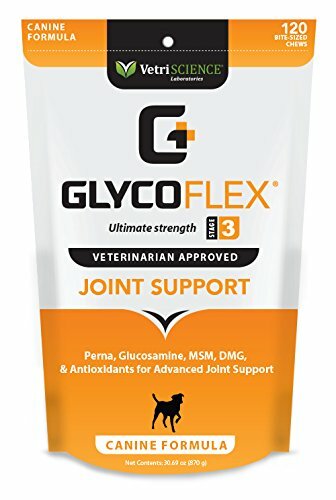 Joint Supplements, Glyco-Flex II is a nutritional supplement used for maintaining healthy joints. It comes in different formulations, chewable tablets for dogs (it is stage II of a comprehensive program for dogs) and either as chewable tablets or soft chews for cats and small dogs. All formulations contain glucosamine as well as Perna Canaliculus (green lipped mussel - which is a good source of protein, minerals, and chondroitin sulfates) and MSM. The tablets are natural imitation roast chicken flavored and the soft chews are chicken liver flavored. Made in the USA.